Announcing Head First PMP, 2nd edition! Jenny and I just put the finishing touches on the second edition of Head First PMP, and it should be out in bookstores as soon as it comes off the presses. We’ve brought it completely up to date to provide 100% coverage of the new version of the PMP exam. It was definitely a lot of work — and in case I haven’t mentioned it lately, I’m lucky to have a coauthor who’s as committed, hard-working, and quality-oriented as Jenny! 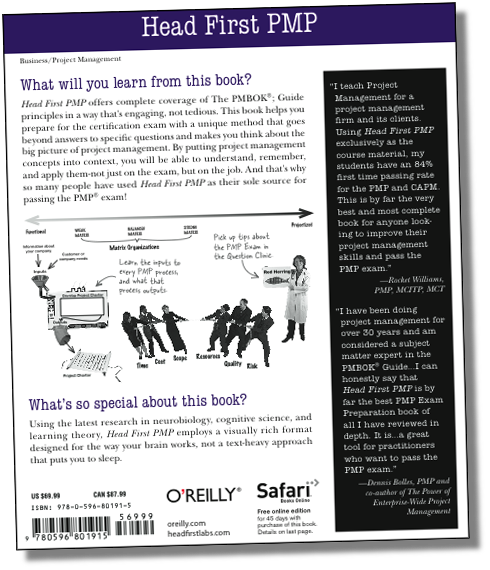 You can download Head First PMP, 2nd Edition today as an O’Reilly Rough Cut PDF (see the end of this post for details). I’m really impressed with all the changes that PMI put into the PMBOK® Guide, 4th Edition (which is what the PMP exam is based on). When we first wrote Head First PMP, there were a few concepts and ideas in the third edition that Jenny and I found a little challenging to explain in a straightforward way that’s easy to understand. When we read the new PMBOK Guide for the first time, I was happy to see that they’d improved some of the more cumbersome concepts that people had a really tough time understanding — like the difference between a scope statement and a preliminary scope statement, for example. Now that the preliminary scope statement’s gone, scope management makes a lot more sense. And there are new additions that made me really happy. It was great to see a whole new process dedicated to collecting requirements. If you’ve read my Requirements posts, you know how important I think requirements management is to making sure your projects are successful. I’ve believed for a very long time that project managers — especially for software projects — have a responsibility, even an obligation, to make sure the whole team understands the project’s requirements. That’s why we put a whole chapter on requirements in our first book! So the Collect Requirements process is a really welcome edition to the PMBOK Guide. There was another really interesting addition: the addition of iterative project phases. I think it’s really useful that the project management world has increasingly embraced iterative project development, especially in software. Personally, I attribute this, at least in part, to the fact that Agile development has soared in popularity over the last few years. The fact that project managers are being trained to work with teams working iteratively is a really good development, and it’s great to see that being reflected on the PMP exam. Also, it was nice to see that the Manage Stakeholders process got a new name: it’s now the Manage Stakeholder Expectations process. I always thought it seemed a little… unrealistic? yes, that’s a good word — it always seemed a little unrealistic to think that a project manager could actually manage stakeholders on a real project. But managing their expectations is something that every project manager needs to do in order to keep a project running. There are lots of other PMBOK® Guide changes, big and small, and we’ve put months of painstaking effort into tracking down each one and making sure the book is completely up to date. And we put together a phenomenal review team to help us ensure that Head First PMP, 2nd edition has 100% coverage of the new version of the PMP exam based on the PMBOK® Guide, 4th Edition. Oh, one more thing. I wanted to take a minute and thank all of the people who’ve been writing to us and asking when the new edition of the book is coming out. I’m sorry I couldn’t write back to each of you individually; we’ve been working really hard to make sure the new edition is as accurate and easy to use as possible, and we just didn’t have time to answer all of your e-mails. But we definitely heard you, and want you to know that we think the second edition is even better than the first! And, as always, if you’ve got questions about project management or difficult PMP topics, definitely send them to us. We get a lot of questions and e-mails, and don’t always have time to answer each one, but we do love Q&A and if it’s a good question we’ll try to write a good answer! 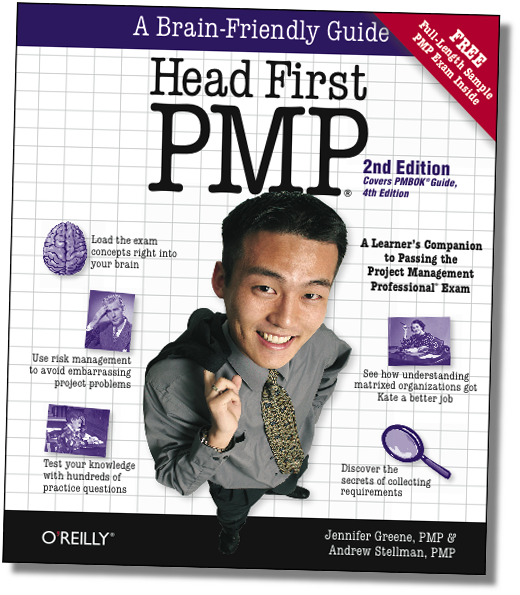 You can download Head First PMP, 2nd Edition today as an O’Reilly Rough Cut. They’ve got a great deal where you can get the online rough cut PDF today when you pre-order the book! Or you can just pre-order the book and get 35% off.